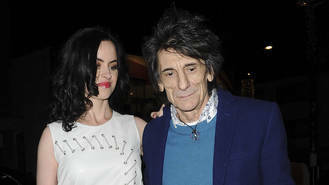 Ronnie Wood's favourite way to pass the time is to cuddle up with his wife Sally and their twin girls. The former Rolling Stones hellraiser, who welcomed his fifth and sixth children, twin girls Gracie Jane and Alice Rose, with wife Sally last year (16), loves spending time with his young family, and considers himself "a lucky man". The 69-year old rocker gushed about the new additions to his family in an interview with Hello! magazine. "Any time I'm with her and the girls, that's the best for me, nothing tops it," he smiled. "When the twins come into our bed and we're all snuggled up together, that, for me, is wonderful - my idea of heaven. It's special. The girls are so cuddly and gorgeous. I'm a lucky man." Now that he isn't spending quite so much time on the road, Ronnie appears to be very much a hands-on father, regularly updating his social media with snaps of the girls, and is enjoying living a quiet life in Hertfordshire, England. "When they (the twins) see Ronnie, they get so excited. You can see it on their faces: 'Yay, it's you!'" gushed Sally. "It's like being in (radio show) The Archers, living here. They have cricket on the green and village fairs and we go to all of it. We love it," she raved about their sedate village lifestyle. Ronnie and Sally married in December, 2012, after a whirlwind six-month romance. The theatre producer gave birth to their twins - her first children - last May (16). The rocker, who is worth an estimated $51 million (£41 million), also has adult children Jesse, with first wife Krissy, who passed away in 2005, plus Leah, Tyrone and adopted son Jamie from his marriage to Jo Wood. Backstreet Boys star A.J. McLean has become a father again. Gorillaz' track-listing for their forthcoming album has leaked online. Justin Timberlake has joked his son has hit the “terrible twos” early with his difficult behaviour. Rita Ora has reportedly overhauled security at her north London home because she is still "shaken up" by her 2015 burglary ordeal. Jason Derulo is planning a break from music to focus on a career in acting. Rapper Drake has been drunk texting Jennifer Lopez since the stars reportedly called it quits on their brief romance. Adele was left overjoyed on Sunday after helping a gay couple become engaged during her concert in Melbourne. Mick Jagger, Ringo Starr and Bruce Springsteen have paid tribute to legendary rocker Chuck Berry.